Scuba Gear Reviews - It's All About The Tanks! Have you wondered what the difference is between the different kinds of Scuba Diving Tanks? Then this article is for you. Scuba gear reviews like this one are for your information and to help you understand more about the world of scuba diving. Scuba stands for Self Contained Underwater Breathing Apparatus. The container that holds the breathable air for the diver is called the tank and is usually carried on the back while diving. 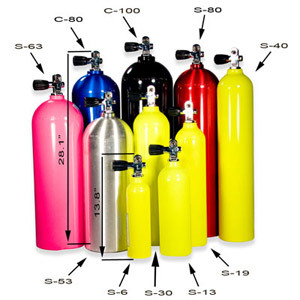 Scuba tanks come in many different sizes, from small emergency air tanks that have like a few minutes of air to the full-size tanks that have hours of air, well depending on the depth of the dive will dictate how much air you will have. The deeper you dive down the more air use up so the faster your tank empties. This is why it is important to know the Gas Laws that govern scuba diving. With them, you can calculate the amount of airtime you will have at a given depth. If you like, follow this link to an explanation of the Gas Laws used in scuba diving. The most common scuba diving tank on the market today is the aluminum 80. It is the most used tank in the scuba diving world. Scuba tanks come in two kinds. They are either made of aluminum or steel. Steel tanks cost more but are physically smaller and slightly lighter than their aluminum counterparts. 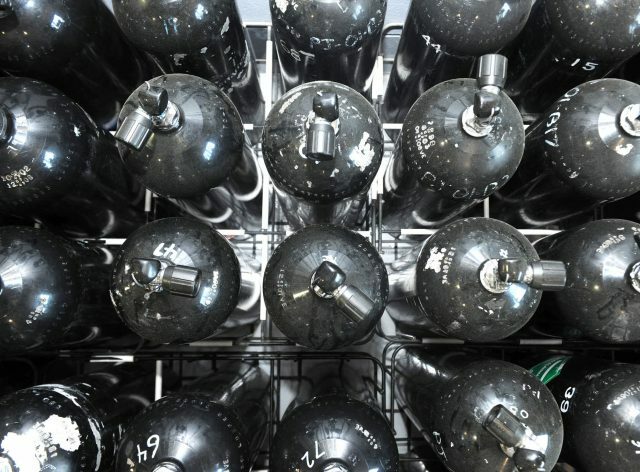 Both types of tanks come in different pressure ratings. They are “low” (2400 to 2640 psi), “standard” (3000 psi), and “high” (3300 to 3500 psi). 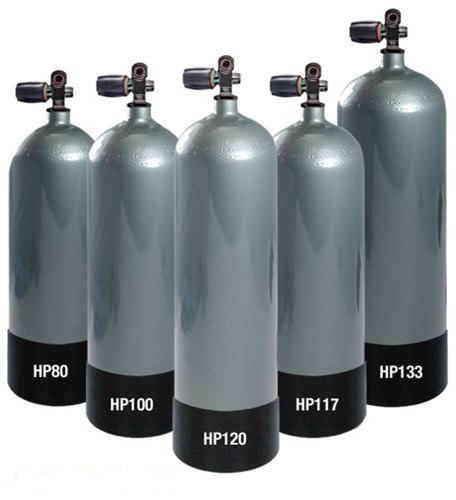 The higher the pressure the more air you but the buoyancy factors change for the tanks. They are physically heavier as well. As a rule of thumb NEVER store a scuba tank empty. This will allow moisture to get into the tank and start to corrode it from the inside. 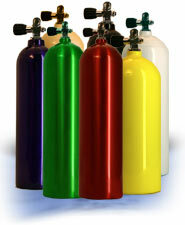 For an in-depth look into diving cylinders (scuba tanks), just follow this link. The standard AL 80 scuba tank is the pretty much the industry standard. It measures 26 inches in length which a considered long. The AL80 weights in at about 35 lbs. Because of its positive buoyancy at the end of a dive, you must use extra weight at the beginning of the dive to compensate. There are three main sizes of aluminum tanks and they are the AL63, AL80 and the AL100. There are also High-Pressure versions and smaller versions but these are the three main types. If your air consumption is the limiting factor on your bottom time, you might choose a larger tank. The aluminum 100 is the largest aluminum tank available, but at a weight of 40 pounds, is considered quite heavy. Aluminum tanks are softer than steel tanks and can get damaged easier. Because they are softer the tank walls have to be thicker thus making the tank heavier than steel. The upside is that they are are not corroded by sea water as quickly as steel tanks. 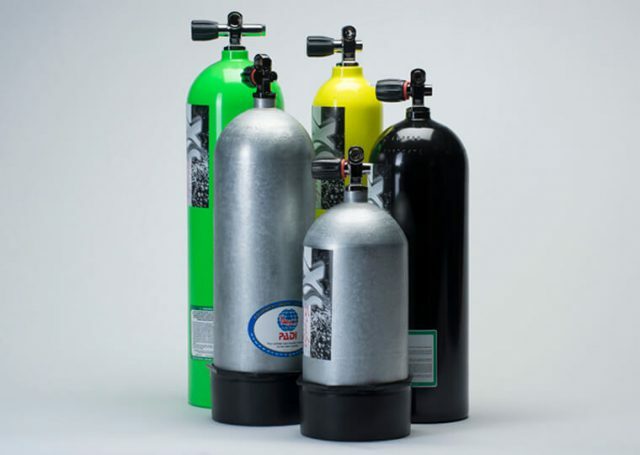 Aluminum tanks also have a negative to positive buoyancy shift as they empty thus requiring you to carry more weight to compensate at the end of the dive. The other big advantage aluminum tanks have is that they are cheaper than steel tanks by a lot. Almost half the price. 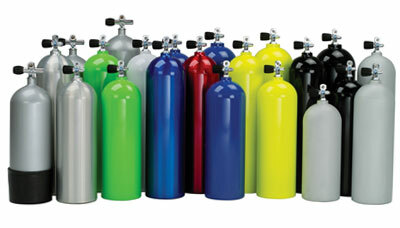 Steel tanks are the most durable and are preferred by many experienced divers. A well cared for steel tank will last for well over 50 years. They are extremely tough and actually weigh less than a comparable aluminum tank of equal capacity. The HP100 steel tank is the most common tank used by sport divers when it comes to steel tanks. Because it is a high-pressure tank (3442 psi) it has more air capacity than the AL80. The steel HP80 is a close match to the AL80 but it is shorter and thinner and only weighs in at 30 lbs. It has better buoyancy properties as well than the AL80 and so is preferred by experienced sport divers. Steel tanks will rust very rapidly in salt water if they are not cared for properly. This means rinsing it after dives, keeping the pressure in at all times, having regularly scheduled hydrostatic tests, etc. By doing this your tank will probably outlive you, lol. Steel tanks also have excellent buoyancy properties as they shift from negative to almost neutral buoyancy as they empty thus requiring you to wear less weight than when diving with aluminum tanks. The AL80 is 26 inches long while the HP100 is 24 inches long and is more manageable for most divers and holds a lot more air. Note the HP117 is also only 24 inches long but it is fatter. The HP80 and the AL63 measure in at 21 inches and work well for smaller statured people. For small women and children, the HP65 is a good choice as it is only 17 inches long. Here is a list of some tanks and their lengths. Tanks come in a standard diameter of 71/4 inches, except for the AL100, HP117, and HP133, which are all 8-inch diameter tanks. Not to worry though your BC will be able to handle both tank sizes. One to consider when using the longer tanks is that not to place it too high up on your BC as you could smash your head on the valve stem when jumping into the water. Also, if you are going on vacation and taking your own tanks, some resorts dive boats do not have 8-inch scuba tank holding racks. Just a couple of things to consider. Tanks can come in a variety of different finishes. You can have any color you want, a custom paint job (like an image or design on the tank), hot dipped galvanized, brushed, shot blast or natural. It should be noted that painted aluminum tanks do not hold up very well as the paint does not seem to adhere to the tank very well. All steel tanks require a coating of zinc or galvanized or painted to prevent corrosion or a combination of them. Any deep scratches or dings in steel tanks must be fixed or else the steel will rust. So let’s summarize this all up for you then, shall we? Aluminum tanks are bigger, heavier, more prone to damage, are the cheapest, and more corrosive resistant than steel tanks. Steel tanks are smaller, lighter, hold more air, tougher, cost almost twice as much, last longer if well cared for, and less corrosive resistant than aluminum tanks. Most divers prefer the steel tanks because they are smaller, lighter, hold more air and have better buoyancy properties than aluminum tanks. But if money is an issue an AL80 will work just fine. 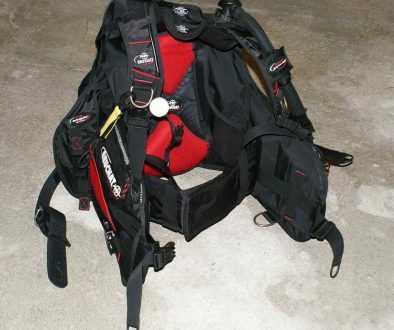 Well, I hope scuba gear reviews like this are helpful and informative for you and will allow you to make a better decision when it comes to purchasing a scuba tank. If you have any questions or comments, then please feel free to leave them below and I will be happy to reply to you. Gas Laws of Scuba Diving – The Science Behind Scuba Diving	Scuba Diving Health Restrictions – Are you Healthy Enough To Dive? 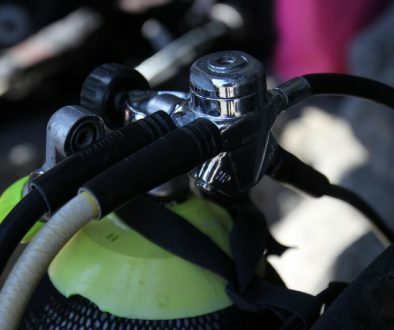 This was a very informative article on scuba tanks. I didn’t realize the difference in aluminum and steel tanks and that is great to know, I would have probably just bought the cheapest. I really like the option of getting your tanks painted, a nice jaws face would be awesome, hehe. Thanks for providing so many important details for beginners, I would love to see actually brands you recommend. Very informative, Carl. I am 46 yrs old and I never knew that SCUBA was an acronym.lol I have an uncle who used to dive and I’ve always wondered, does the same equipment work in saltwater and freshwater? Hi Joseph. Yes, u use the same equipment for salt or fresh water. The only difference is it takes a little longer to clean your gear after a saltwater dive than a freshwater one, lol. You should think about giving it a try. Take care and thanks for stopping by and I hope to see you in the water soon. Great information, I love snorkeling but am thinking of learning to scuba dive. Is it advisable to buy my own tank if I use it only two or three weeks a year or should I better rent one? I think I would go for a steel tank, an HP100 what do you think for starters? Hi Stefan. If you like snorkeling you are in for a treat when you scuba dive. If you are not going to dive a lot then I would just rent the gear. The only thing is that rentals are usually Alum 80’s. Steel tanks are the preferred tank to get through and will last you a very long time if you take care of them. So it would depend on your financial situation and how much you dive as to whether you buy your own tank or not. I prefer the steel tanks for the better buoyancy control u get with one. Alum 80’s are pretty buoyant and so u need more weight which u don’t want. The upside is Alum 80’s are cheap and u can pick one up for around $150. Well, I wish you well on your scuba diving journey and hope to see u in the water soon. Wow, very cool. I didn’t know there was so much history behind the scuba tank, or that there were different kinds! Thanks for the info! Hi Jacob and thanks for stopping by. Yes, there is quite the variety of tanks, lol. I appreciate your visit and hope to see u soon here again.